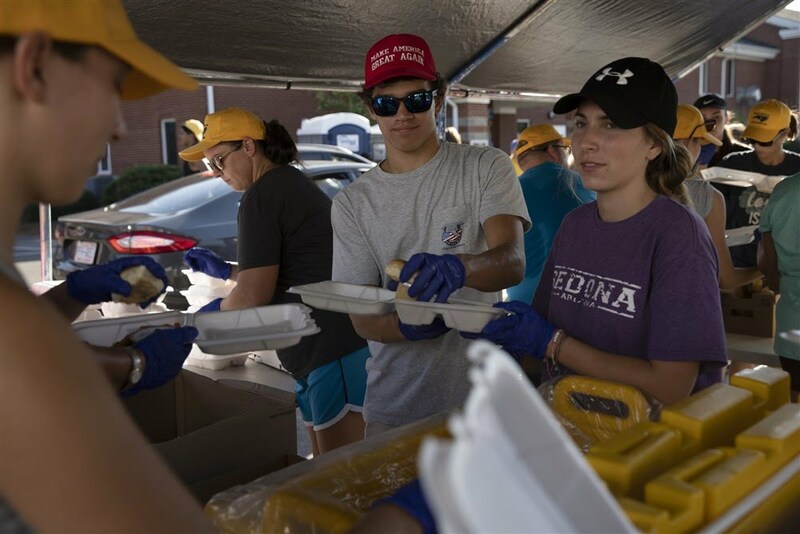 For seven hours, 125 volunteers aged 60, 70, and 80 works under the scorching sun giving 20,000 hot meals and water to those affected by Hurricane Florence. They work twice a day, sleeping on the floor in church classrooms and eat the same food they serve. For one instance that meant chicken patties on rolls, with sides of carrots and applesauce. The volunteers not only hand out food and water, but are also working on rebuilding houses caused by the 2016 Hurricane Matthew. The volunteers attempted to restore the 200 houses for the Lumberton residents, but did not reach that goal because Hurricane Florence came in and damaged the same area. According to Duke Energy, floodwaters are supposed to continue for another week and homes will remain inaccessible. Stores do not have electricity and many store doors are shattered. From NBC News, Carole Allen, a 54-year-old volunteer, said, “South Lumberton and West Lumberton have never recovered from Matthew, it has been a ghost town for the past two years.” Allen is a substitute teacher for Lumberton’s school district, but spends more time volunteering. Allen’s home had not been affected by the flooding, however; not all volunteers were fortunate. 18-year-old volunteer Bradley Abbot, a student at the University of North Carolina Pembenton had the flooding effect the house he shares with his brother and father. This is the second time Abbot’s father had to deal with hurricane damage since Hurricane Matthew. Despite the prediction of more flooding, volunteers will continue to hand out meals and rebuild Lumberton.